Aurora, OH: Network Technologies Inc (NTI) today announced the addition of three new Video Converters/Extenders via Fiber Cable to its popular line of video converters. Available models include VGA to DVI, Component Video to DVI, and S-Video/Composite Video to DVI that extend up to 1,640 feet (500 meters) away. The Converters/Extenders convert video into a DVI signal that can be extended to up 1,640 feet (500 meters) using single-strand multimode SC fiber optic cable. The converter/extender system has two components, the converter/transmitter, which connects to the video source and also supplies video to a local monitor that supports the video source type, and an optional ST-1FODVI-R-SC500M receiver that is compatible with all three converters and connects to a remote DVI monitor. The units are interconnected by a single-strand multimode (50-micron or 62.5-micron) SC fiber optic cable. The VGA-DVI-FOSC VGA to DVI Converter/Extender converts analog VGA into a digital DVI signal and supports resolutions to 1920x1200 (WUXGA). The CMP-DVI-FOSC Component Video to DVI Converter/Extender converts component video into a DVI signal and supports resolutions to 1080p. 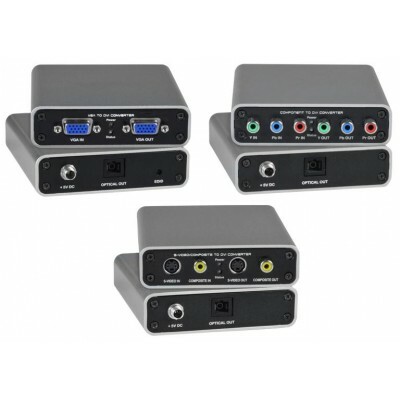 The SVCV-DVI-FOSC S-Video/Composite Video to DVI Converter/Extender converts S-Video or Composite video into a DVI signal and supports resolutions to 1280x1024. Available for immediate sale, the VGA-DVI-FOSC costs $935, the CMP-DVI-FOSC costs $915, the SVCV-DVI-FOSC costs $925, and the ST-1FODVI-R-SC500M receiver costs $370 each.